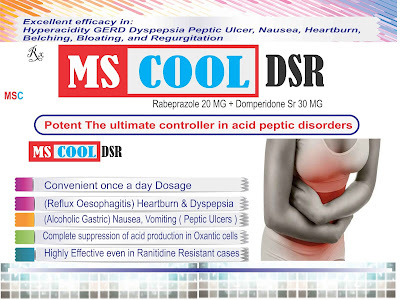 Pantoprazole+ Domperidone DSR | MedicScience Life Care Pvt. Ltd.
• Duodenal ulcers (including combination therapy with clarithromycin and amoxicillin to erradicate H. pylori and prevent recurrence). • Pathological hypersecretory conditions, including Zollinger-Ellison syndrome. • Hypersensitivity to rabeprazole or related drugs (benzimidazoles). • Severe hepatic impairment (dose reduction may be necessary). • Geri: risk of hip fractures in patients using high-doses for >1 year. • OB: Lactation: Pedi: Pregnancy, lactation, or children <12 yr (breastfeeding not recommended; use in pregnancy only if needed; safety not established). GI: abdominal pain, constipation, diarrhea, nausea. Misc: allergic reactions, chills, fever. • Pantoprazole is metabolized by the CYP450 enzyme system and may interact with other drugs metabolized by this sytem. • May absorption of drugs requiring acid pH, including ketoconazole, itraconazole, atazanavir ampicillin esters, and iron salts. • May blood levels of digoxin. • May the risk of bleeding with warfarin (monitor INR/PT). • May the antiplatelet effects of clopidogrel. • Binds to an enzyme in the presence of acidic gastric pH, preventing the final transport of hydrogen ions into the gastric lumen. Therapeutic Effects: • Diminished accumulation of acid in the gastric lumen, with lessened acid reflux. • Healing of duodenal ulcers and esophagitis. • Decreased acid secretion in hypersecretory conditions. Pantoprazole is widely utilized to prevent and heal gastrointestinal (stomach and guts) problems, which is caused due to overmuch stomach acid. Rapebrazole is a proton pump inhibitor (PPI), sometimes identified as an ulcer healing drug. This is also very beneficial for inhibiting secretion and gastric from the stomach as well as to treat various acid related gastrointestinal conditions. It heals stomach and intestinal ulcers and manages gastro-oesophageal reflux disease (GORD a condition in which acid rises up from the stomach into the oesophagus [gullet] with symptoms of heartburn, acid regurgitation and pain on swallowing). Domperidone is a dopamine antagonist with anti-emetic properties domperidone does not readily cross the blood-brain barrier. Its anti-emetic effect may be due to a combination of peripheral (gastrokinetic) effects and antagonism of dopamine receptors in the chemoreceptor trigger zone, which lies outside the blood-brain barrier in the area postrema. Studies in man have shown oral domperidone to increase lower esophaegeal pressure, improve antroduodenal motility and accelerate gastric emptying. There is no effect on gastric secretion. Gerd, Heart Burn & Hyperacidity, Reflux Oesophagitis, Regurgitation & Flatulance,Gastric & Peptic Ulcer. Rabeprazole is a partially reversible inhibitor of H+K+ ATPase which is activated in the acidic lumen of the gastric parietal cells. The canalicular membrane of the gastric parietal cells contains the proton pump - H+K+ ATPase enzyme . It exchanges H+ ions for K+ ions using energy generated by the breakdown of ATP to ADP. This enzyme represents the final step for acid production in the stomach. It dissociates more quickly and completely from H+/K+ ATPase than omeprazole. thereby decreases gastric acid secretion. pH dependent interactions with digoxin and ketoconazole. a). Concomitant administration of anticholinergic drugs may decrease the effect of domperidone. b). Azole antifungals / macrolide antibiotic, increases plasma levels of domperidone. Rabeprazole being the fastest acting PPI gives a quick relief from the hyper acid secretory conditions. A significant percentage of GERD patients have delayed gastric emptying10 and hypotensive esophageal sphincter. Domperidone, a prokinetic and anti-emetic improves the LES tone, increases the gastric motility and thus helps in gastric emptying. In GERD patients not responding to Rabeprazole alone, combination of Rabeprazole and Domperidone may be effective. Absorption:Rabeprazole sodium is acid labile and formulated as an enteric coated tablet. It is rapidly, dose dependently absorbed after oral administration. Food does not affect the absorption or the peak plasma concentration but delays the time to peak plasma concentration (tmax) by about 1.5 hours. Bioavailability is not influenced by the co-ingestion of either food or antacids. Distribution:Rabeprazole is 97% bound to human plasma proteins. Metabolism:It undergoes extensive metabolism via nonenzyme metabolism to form major inactive metabolites (a thioether carboxylic acid metabolite and its glucuronide) and also minor metabolism by CYP2C19 and CYP 3 A4 to desmethyl and sulfone metabolites. Rabeprazole does not accumulate significantly during repeated administration. Excretion:Approximately 90% of the drug was eliminated in urine, primarily as thioether carboxylic acid; its glucoronise and mercapturic acid metabolites. The remainder of the dose is recovered in the faeces. Absorption:Domperidone available in PARIT-D capsules is in the form of controlledrelease pellets, facilitating the use of PARIT-D as once daily dosage. In vitro dissolution test using 0.1 N HCl at 37 ± 5°C demonstrated a release of 15 - 40%, 30 - 60% and 55 - 85% of domperidone from PARIT-D at 1, 4 and 8 hours respectively. The released domperidone is rapidly absorbed following oral administration.26 Systemic bioavailability of oral domperidone is 13 - 17%, probably the result of hepatic first-pass and gut wall metabolism. The half-life is approximately 7.0 hours. Oral bioavailability is decreased by prior administration of cimetidine or sodium bicarbonate. Distribution:Oral domperidone does not appear to accumulate or to induce its own metabolism; a peak plasma level after 90 minutes of 21 ng/mL after two weeks oral administration of 30 mg per day was almost the same as that of 18 ng/mL after the first dose. Domperidone is 91 - 93% bound to plasma proteins.26 It does not readily cross the blood brain barrier and therefore is not expected to have central effects.22 However, according to animal studies, very low amounts cross the placental barrier and it is excreted in the breast milk. Metabolism:Oral domperidone does not appear to accumulate or induce its own metabolism. It undergoes rapid and extensive hepatic metabolism by hydroxylation and N-dealkylation. In vitro metabolism experiments with diagnostic inhibitors revealed that CYP3A4 is a major form of cytochrome P-450 involved in the N-dealkylation of domperidone, whereas CYP3A4, CYP1A2 and CYP2E1 are involved in domperidone aromatic hydroxylation. Elimination:Urinary and faecal excretion amounts to 31 and 66%, respectively, of the oral dose. The proportion of the medicine excreted unchanged is small (10% of faecal excretion and approximately 1% of urinary excretion). The plasma half-life after a single oral dose is 7-9 hours in healthy subjects but is prolonged in patients with severe renal insufficiency. Welcome to MedicScience LifeCare Pvt.Ltd. we actively pursue ways to keep you informed about our activities. Our website is one of the ways To express Our Achievements and Activities to The World. MedicScientist.com Since 2010, we have Written hundreds of articles for about multiple topics, I hope you will like them. We are committed to Cure & Care The Life. MedicScience has a Value Charter – TTT– Trust, Transparency and Teamwork. It symbolizes the philosophy of MedicScience ; its reason for existence, values and principles it follows in its daily activities. It also provides a common direction for all employees of MedicScience ; the way to conduct in personal and professional life. key to the future of MedicScience LifeCare Pvt.Ltd. industry. The pharmaceutical advances for considerable improvement in life expectancy and health all over the world are the result of a steadily increasing investment in research. MedicScience Life Care Pvt. Ltd. Welcome to MedicScience Life Care Pvt.Ltd. © 2016 MedicScience Life Care Pvt. Ltd. . All rights reserved MedicScience LifeCare Pvt.Ltd.